KEEPS THE KIDS ENTERTAINED FOR HOURS - Fun party favors that transform flash lights, streetlights, headlights, display lights, lamps, etc. into various holiday images like Santa's and angels and snowflakes, all with a beautiful glowing holographic effect. These are perfect for long car rides at night when the kids become bored. Nevertheless, they are a great supplement for an enchanting light experience. GREAT HOLIDAY CARD ADD ON - Our holiday specs are more fun than you think! Just take out your phone and see for yourself! Turn on the flashlight and watch the LED light turn into a holographic image. 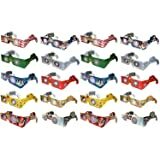 These glasses make excellent holiday gifts, which you can add to any party kit or greeting card. Send these out with Christmas party invites or use them for a stellar office party. These will Make you laugh, and offer an enjoyable experience for all sorts of gatherings. A MUST FOR HOLIDAY LIGHTS VIEWING - You can see different shapes when you look at various sources of lights. Bring these along when viewing your neighbor's lights or attending a light show event. They fold up nice and easy with durable cardboard. Even Grandma & Grandpa will enjoy these. These are fantastic for the young and old! Our glasses are a huge hit for family gatherings or whenever you have people over for the holidays. USA MADE HOLOGRAPHIC LENSES - Only a limited amount Available, so BUY NOW! Be amazed this holiday season as our lenses transform ordinary holiday lights, city lights, street lights and more into magical holiday images. It's amazing! A perfect item to light up the lives of those around you. These are excellent choices for greeting cards, teacher/student gifts, package decorations, holiday gifts, holiday light displays, corporate gift giving or fundraising. Buy now before We run out! 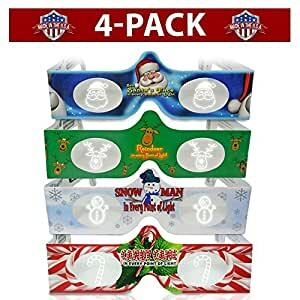 Included in our variety 4 Pack is our Candy Cane, Snowman, Santa and Reindeer designs. With our Holiday specs, sharply view Images in every point of light. For best usage. Stand 20 - 25 Feet away from any point of light. Holographic Images appear larger when farther away. While wearing these glasses look at Christmas tree lights, city lights or any bright distant point of light to see the magical message of Holiday Specs. These glasses are not intended for use over extended time, looking into the sun, performing physical activity, driving vehicles or operating machinery. Any other use of this product is not recommended. Our glasses are the perfect supplement for family gatherings or sending out Christmas party invitations and holiday Invites. I didn't read closely enough. The glasses produce pictures when looking at lights. These are terrible for viewing Christmas lights. The work well for street lights. Kids will enjoy looking through them while riding in a car at night. Not good for viewing Christmas lights! Purchased for to go with gifts for 2-7yr olds. Everyone (including adults) lived these. Not super sturdy, so the younger ones bent their earpieces quickly. Lenses have held up well though! 5.0 out of 5 starsFestive and Fun! These are great for kids, but work well for adults. I bought them for my friend and her family, but, of course, needed to buy a set for myself to test it out. :) Works well and is very holiday festive! Just to be clear, these are for kids. If you try to wear them as an adult you'll have to bend them a bit and they still might pop off of your ears because the arms are too short. Still worth buying, I'm just warning you.